Interstate 780 is a four-lane freeway joining the cities of Vallejo and Benicia along a parallel alignment to Carquinez Strait in Solano County. The west end of I-780 ties into Curtola Parkway, a four-lane arterial spurring west to California 29 (Sonoma Boulevard) near Downtown Vallejo. 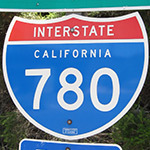 The link between Interstates 80 and 680 was created in 1976,1 when I-680 was re-routed northward from Benicia to Fairfield over the California 21 freeway to I-80. The freeway mainline dates back to 1962, with the I-80 bridges at the west end built in 1958. Interstate 780 arcs one mile eastward from the diamond interchange (Exit 6) with East Fifth Street in Benicia to Interstate 680 at the north end of the Benicia-Martinez Bridge over the Sacramento/San Joaquin River Delta. Photo taken 07/17/09. Eastbound Interstate 780 reaches Exit 7A for I-680 north to Fairfield. The flyover connection was constructed during early stages of the 2001-07 Benicia-Martinez Bridge expansion project. Photo taken 07/18/09. Interstate 780 concludes as traffic separates for I-680. Traveling 70.5 miles overall, I-680 encircles the San Francisco Bay area through a number of East Bay Cities south to San Jose. Photo taken 07/17/09. 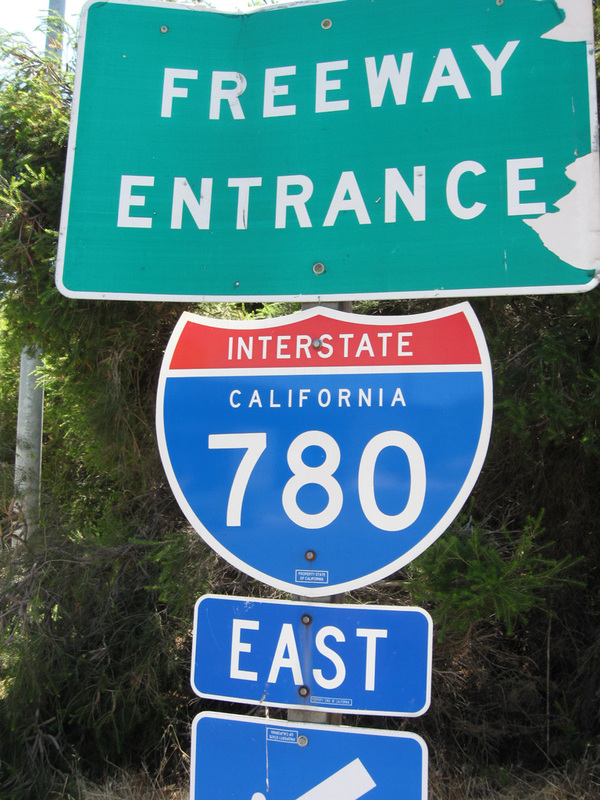 This button copy sign along I-780 east at Fifth Street pre-dated the conversion of I-680 to California 21 through Benecia, with an outline for I-680 overlaying a shield for the previous state route. This style of overhead sign was common along I-680 prior to its reconstruction through Concord and Walnut Creek in the 1990s. Photo taken 11/26/04. Constructed between late 2001 and August 2007, the Benicia-Martinez Bridge spans the Sacramento and San Joaquin Delta, which is also known as the Carquinez Straits and Suisun Bay. The concrete segmental bridge accommodates five lanes of northbound traffic for I-680 to the left exit with Interstate 780. Photo taken 07/05/13. The directional T interchange (Exit 58A) linking Interstates 680 and 780 was rebuilt along with the new Benicia-Martinez Bridge. Left ramps remained in the design due to area terrain and cost reduction. Photo taken 03/10/15. Crossing into Solano County Interstate 680 makes a gradual descent from the Benicia-Martinez Bridge above Army Point. I-780 branches northwest, with the initial four exits serving the city of Benicia. Photo taken 03/10/15. Prior to completion of the northbound bridge in 2007, the 1962-built Benicia-Martinez (George Miller, Jr. Memorial) Bridge carried two-way traffic across Carquinez Straight. Photo taken 04/02/04. Three lanes of traffic along I-680 north passed through a toll plaza prior to the three-wye interchange with Interstate 780. Photo taken 04/02/04. The left exit for I-780 departed below the partially built flyover linking I-780 east with I-680 north to Interstate 80 near Cordelia. Photo taken 04/02/04. Interstate 680 crosses a long viaduct above Bayshore Road and industrial areas west Suisun Bay on the one mile approach to Exit 58 and Interstate 780 west. Photo taken 11/28/04. Interstate 680 south at the original three-wye interchange with I-780 west. Interstate 780 leads west through Benicia to Vallejo; I-680 continues south over the Benicia-Martinez Bridge en route to Concord, Walnut Creek and Danville. Photo taken 08/23/03. Advancing west on Interstate 780, three quarters of a mile ahead of Interstate 80. Photo taken 03/10/15. Substandard ramps connect I-780 west with Cedar Street north just ahead of the cloverleaf interchange with I-80. A eaving traffic pattern ensues between the Cedar Street on-ramp and Exit 1B. Photo taken 03/10/15. Exit 1B parts ways with Interstate 780 west for I-80 leading northeast to Vacaville, Davis and Sacramento. The Laurel Street Bridge spanning the freeway here was replaced between May 2017 and January 2018. Photo taken 02/19/12. Exit 1A loops onto a c/d roadway lining I-80 west to Lincoln West. Interstate 80 continues southward across the tolled Alfred Zampa Bridge between Vallejo and Crockett. Photo taken 02/19/12. Interstate 780 spurs west from Exit 1A a quarter mile to Lemon Street at Curtola Parkway. Photo taken 03/10/15. Curtola Parkway extends west from Lemon Street to SR 29 south of Downtown Vallejo. The adjacent Curtola Park and Ride facility was relinquished by the state of California in Decemmber 2017.1 Photo taken 03/10/15. The first of two guide signs along Interstate 80 east for I-780 appears at the antiquated folded diamond interchange (Exit 29C) with Lincoln Road east at Magazine Street. Photo taken 07/18/09. A collector distributor roadway (Exit 30A) separates from the eastbound mainline of I-80 for ramps to Interstate 780 to Benicia, Curtola Parkway west toward Downtown Vallejo and Lincoln Road at Benicia Road. Photo taken 07/18/09. Passing through a substandard parclo B2 interchange with 14th and Georgia Streets, motorists on Interstate 80 west next approach the c/d roadway (Exit 30A) for I-780 east and Curtola Parkway west. Photo taken 07/02/13. The single lane c/d roadway approaches the westbound off-ramp to Curtola Parkway, the local continuation of I-780 west to California 29. A loop ramp follows for the freeway east to Benicia and the Benicia-Martinez Bridge (I-680) south to Concord. Photo taken 07/02/13. Curtola Parkway east transitions to Interstate 780 beyond the traffic light at Lemon Street. The freeway quickly meets Exit 1A for I-80 west to Oakland and San Francisco. Photo taken 11/26/04. The first sign for Interstate 780 eastbound to Benicia and Martinez appears as Exit 1B loops onto I-80 east toward Fairfield and Sacramento. This formerly was the northern terminus of Interstate 680. Photo taken 11/26/04. Page updated June 23, 2018.